We have designed and developed Eyes-Free Yoga on the Microsoft Kinect. It emulates a yoga instructor, teaches six yoga poses, and provides custom auditory-only feedback. After a player is guided into the pose by the game, they receive the custom feedback to improve their pose. We collaborated with ten yoga instructors through the design, development, and evaluation. We ran a study with 16 people who are blind or low vision. This work was published at ASSETS 2013. Eyes Free Yoga is available for download! Rector, K., Bennett, C. L., & Kientz, J. A. (2013, October). 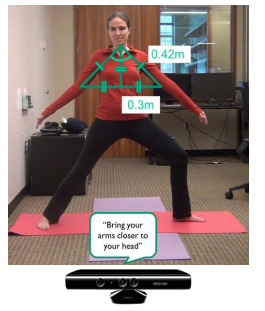 Eyes-free yoga: an exergame using depth cameras for blind & low vision exercise. In Proceedings of the 15th International ACM SIGACCESS Conference on Computers and Accessibility (p. 12). ACM.